Supermarket group William Morrison - which last week sealed the takeover of rival Safeway - has reported a healthy rise in profits. The family run group said its annual pre-tax profits rose 13.2% to £319.9m ($583.8m). 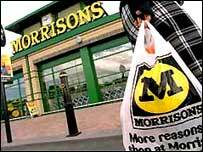 The combined Morrisons/Safeway group is now Britain's fourth largest supermarket chain. Chairman Sir Ken Morrison said: "A solid team performance delivered the goods once again." Morrisons' £3bn acquisition of Safeway brought to an end one of the most keenly-contested UK takeover struggles in recent years. The Bradford-based group sparked a bid battle for Safeway last year after launching a £2.9bn offer for the firm. It claimed victory after the government ruled against rival supermarket groups' bids on competition concerns. Morrisons said it had received "great interest" in the 52 Safeway stores the UK market regulator has required it to sell as a result of the takeover. Morrisons' acquisition of Safeway - which will give the grocer a bigger slice of the market in southern England - increases the pressure on Sainsbury's for third place in the UK supermarket rankings. Britain's big three supermarket chains - Tesco, Asda and Sainsbury's - all made counter-offers for Safeway, along with billionaire retail entrepreneur Philip Green.